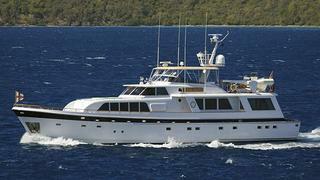 Jeff Partin at Fraser Yachts asks me to report a $300,000 price drop on the 27.43m motor yacht Trilogy. A rugged long-range cruising yacht, Trilogy was built in 1985 by Cheoy Lee to a design by Jack Hargrave. She has been continually upgraded including a mechanical refit in 2003 at Bradford Marine and an interior refit in 2004 under the direction of Patrick Knowles. Accommodation is for six to eight guests in a master, double and twin cabins, plus two Pullman berths. She is fitted with Naiad stabilisers, and twin 650hp GM engines give this superyacht a cruising speed of 10 knots and a range of 2,500 nautical miles. She has just completed a refit to include a complete bottom job, updating all running gear and and paint. Trilogy is now down from $1,495,000 to $1,195,000.